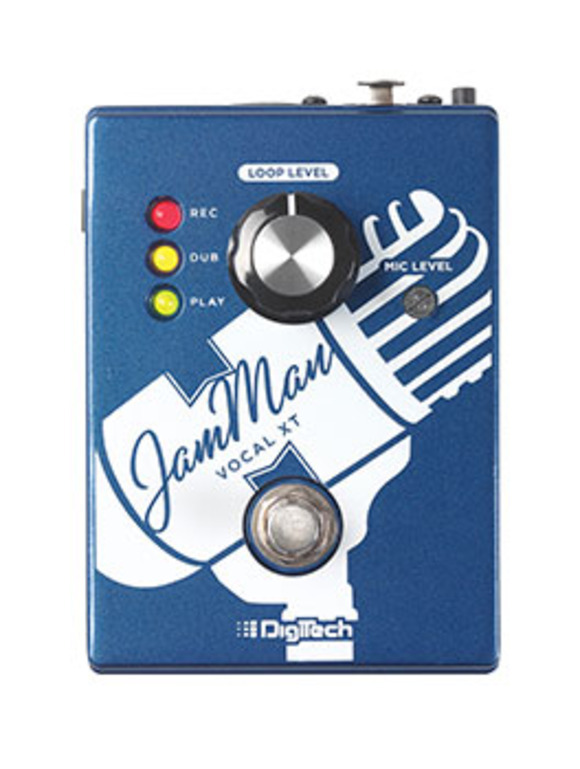 SALT LAKE CITY, Utah –HARMAN’s DigiTech today introduced the JamMan Vocal XT, the first ever dedicated stompbox looper for vocalists. The JamMan Vocal XT makes looping easier than ever before by giving vocalists the ability to create harmonies or rhythmic counterpoints with simple presses of a footswitch. A vocalist can connect their favorite mic directly to the JamMan Vocal XT and its built-in studio quality dbx® mic preamp with phantom power will retain true vocal tone ensuring original vocals and loops sound crystal clear. The JamMan Vocal XT features up to 10 minutes of stereo looping and SilentClear™ technology, which clears the pedal’s loop memory without starting playback first. The pedal also provides the ability for a vocalist to link together multiple JamMan Vocal, Express or Solo XT’s through an innovative pedal-linking capability called JamSync. The JamMan Vocal XT’s control layout is simple yet incredibly versatile – a single pedal switch, three Record, Dub and Play LEDs and a Loop Level knob provide access to a multitude of looping functions. All loop recording, playback and loop overdubbing can be controlled simply by clicking on the pedal switch. The three LEDs indicate looping and phrase sampling status – red for record, green for playback and yellow for overdubbing. This simple but effective looping scheme has been standard on single-button JamMan loopers for years to create lush, richly textured loops. The JamMan Vocal XT’s input has also been optimized to allow multiple JamMan Vocal XT’s to be connected to each other to create synchronized multi-track vocal loops quickly and easily. The JamMan Vocal XT includes a power supply and measures just 4.8 x 3.4 x 2.1 inches, the JamMan Vocal XT fits easily on any pedalboard and its rugged metal case is built to take the rigors of the road. The JamMan Vocal XT is available immediately at a suggested retail price of $229.95.